Steve McCurry's iconic images have made him one of the world's most popular photographers working today. Now, for the first time, he shares the stories behind stunning images taken from around the world throughout his extensive career.
. . .[McCurry] gives you a sense of not just the event but the intimate nature of photographing the event as well. The reader is offered an authentic glance behind the scenes at the life of a true voyager. "Untold" is an essential read for any aspiring photojournalist or anyone with that wanderlust spirit. "Photo.net, "Best Photography Books of 2013"""
Spread over some 250 pages are famous and lesser-known images, as well as anecdotes and shots of ephemera he gathered along the way, including letters and journal pages. ""The Wall Street Journal"""
An incredibly thorough book. . . This collection helps us understand how and why someone could create images like those, and makes us all the more thankful for them. . . This book represents a great addition to any photo library. "Photographer's Forum""
An engrossing new book about his career, "Steve McCurry Untold: The Stories Behind the Photographs" contains photo series, essays, journals, and assignment letters. "Newsweek/The Daily Beast""
McCurry takes readers on an amazing global journey in "Untold". . . This is a book suited for both browsing and focused reading. 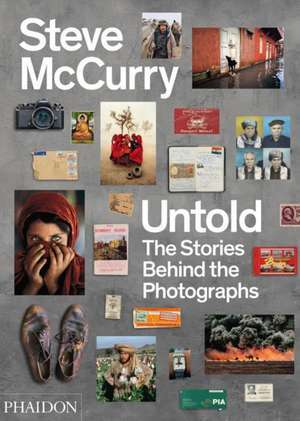 ""Bookpage"""
"Untold" spans 30 years of McCurry's career and includes fascinating ephemera from his travels: diary entries, photos of him at work, and some of the 20-plus passports he's gone through over the decades. McCurry survived the Slovenia plane crash, as well as armed robbers and bombings in Afghanistan, but what comes through in his images is wonder, rather than suffering. He manages to make the world seem enormous and quite small; exotic, and somehow familiar. "TIME LightBox""